In a year where runDisney has introduced 10K runs, the Dumbo Double Dare is similar to the Goofy, but a 10K run on Saturday and a half marathon on Sunday. While I had run the Disneyland half marathon previously, I felt doing both in the same weekend would be a good challenge, even if it was a scaled down version of what I had run earlier in the year. What I didn’t expect was the hottest weekend they had experienced all summer in Anaheim. When I picked up my race packet at the run expo, I had one other surprise coming. I picked up my bib and as I was walking away from the counter, I noticed the strangest thing. There was an A in the upper left hand corner where it tells the runner which corral they would be starting in. This meant I was starting in the first group of runners, who are normally the fastest. On Saturday was the Alice in Wonderland themed Disneyland 10K. The 10K started in the same place as the half marathon, but was distilled to the more interesting parts of the race. When we began, we headed out onto the streets of Anaheim and headed south for a mile before turning east for a long block before turning north. After about two miles, we turned into the backstage area and began to enter Disney California Adventure. A mile and a half of circling through the sights and sounds of that park led to a backstage road that took us right into Disneyland. Up Main Street to Tomorrowland and Fantasyland before leading us back out of the park and looping around to bring us back into Fantasyland and Cinderella’s Castle. Running through the middle of the castle led us out to Frontierland and New Orleans Square and back out of the park. From there, we had a little more backstage running before a straight run up Downtown Disney and the finish line. Like the Yankee Stadium 5K, I wore Google Glass to record the entire run to share online. 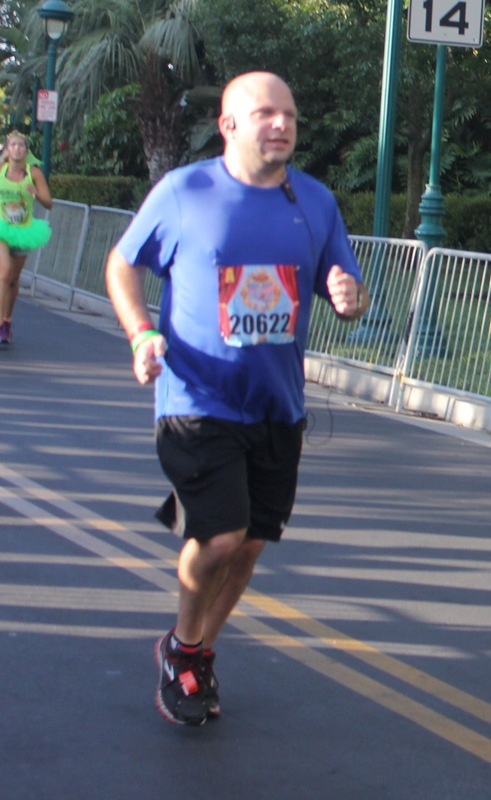 With the 10K behind me, that left the Disneyland Half Marathon Sunday morning. Under cover of darkness, we began running. While we began running south, we didn’t go as far before turning east and looping around to enter Disney California Adventure from the opposite side after approximately 2 miles. We ran through to the lights and sounds of the World of Color, the pier, Cars Land and the other sights of California Adventure before heading north to Disneyland. While the 10K led us out north for a loop, the half marathon was a straight counter clockwise run around Disneyland with a detour sending us for a picturesque view of the passageway in the center of Cinderella’s Castle before sending us out of the park. From there, it was a four mile run careening about the local streets of Anaheim to local dancers, marching bands, and car clubs to circle the outside of the Honda Center, home of the Anaheim Ducks. A straight south run down the Santa Ana River Trail, which ran beside a dried out waterway, took us to Angel Stadium, where we ran around the warning track and could see ourselves on the jumbotron. The baseball stadium was a welcome reprieve from running on the streets, but we had a little over three miles left to go, most of it back on those streets. As we got closer to the Disneyland Hotel, the crowds slowly grew thicker. As we approached the final turns, the spectators crowded in to cheer our final hundreds of meters to complete the race. While not the same as running the Goofy, the Dumbo Double Dare was a different kind of challenge. It felt to get out there and run California one more time before embarking on a new journey in my running career.